This is the first set sent to me for review by Tradition of London. Tradition of London have been trading for over 50 years and though there have been ups and downs including in 2012 the closing of the London shop they are still going strong. Their soldiers are still made in Nottingham, England but they have a base in Stockholm, Sweden where all the soldiers are dispatched from. Over the years Tradition have supplied many museums as well as special editions including Carlton Television for the Sharpe Series. Other notable customers have been The Tower of London, Mary Rose and the National Army Museum. 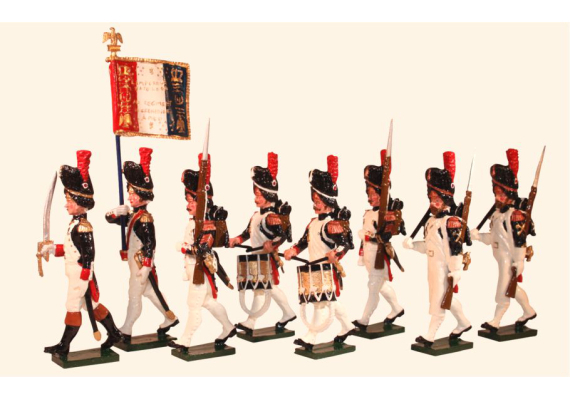 Tradition of London sell a wide range of Toy Soldiers in various scales. They also sell white metal kits for those brave enough to build and paint their own. The Kits come at a very reasonable price, for those with the skills (or those wanted to gain the skills) they excellent value for money. They also sell Del Prado, King and Country, Steadfast, W Britain, Bravo Delta and CBG mignot figures plus miniatures for wargames and other items like paint and books\magazines. They also have the envious claim to the largest stock of Toy Soldiers you'll find. So pretty much something for everyone. The set I received for review I couldn't have chosen better myself. They show off the different styles of Toy Soldier on the market when you compare them to my previous Thomas Gunn reviews. 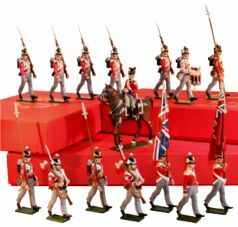 Thomas Gunn soldiers are your perfect example of the modern toy soldier, where as the set I received from Tradition of London show of the high gloss traditional toy soldier, little changed since Victorian times. Which considering they are Napoleonic suits them perfectly. The set is 54mm French Grenadiers of the Guard, Head of Column. Example of presentation box. Not this actual set though. The set comes in a lovely red presentation box with Tradition of London's motif in gold on the front. Straight away it struck me as the perfect present for anyone into Toy Soldier or the Napoleonic Wars. On the side of the box is a label saying "Hand Made Traditional Style Toy Soldiers Made in England. French Grenadiers of the Guard. Napoleonic Wars - Toy Set 768". Lifting the lid and then removing a layer of padding you then finally lay eyes on your collection. Quality hits you instantly. You know you have a special set here and something to show off as often as possible. Set into a layer of padding are eight soldiers, their gloss paint shining out. 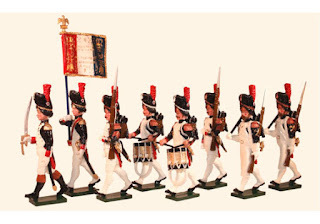 You instantly have a fantastic set to create a diorama of marching French grenadiers. The set consists of one Officer with sword drawn, one Standard bearer, two Sapeurs, two Sergeants and finally two Drummers. Only the most physically powerful soldiers were chosen to become a Grenadier and would lead assaults on the field of battle, even leading the way through breaches during siege warfare. So you are looking at the best France can offer and all kitted out they do look like fine specimens! The Officer is leading the troops with his Infantry Saber (Briquetes) drawn and held upright. The Grenadiers had be a formidable sight so they wore tall bearskin helmets with a red plume to give them a taller appearance. Though the Officer here is clean shaven many wore moustaches or beards, again to give them a more war like appearance. The Officer doesn't carry any back pack. He does appear to be wearing some sort of medal. He is wearing black boots, white breaches, white vest, white gloves, blue coat with dark blue collar, white lapels, red cuffs with white cuff flaps, red turnbacks and pocket piping. He is also wearing white gloves. He is marching and stands on a green base. He is painted in Gloss and really does have an authentic Toy Soldier appearance, perfect for the era he represents. The Standard bearer again is marching and stands on a green base. He is wearing a similar uniform to the Officer expect this time he isn't wearing black boots with tan tops. Wears bearksin cap with red plume. His coat is dark blue with dark blue collar, white lapels and red turnbacks and pocket piping. He is wearing black boots and white gaiters. He also has a red shoulder belt designed for the end of the standard pole to fit into so he can march with just one hand holding onto the Standard. The standard has a bronze eagle on the top and a blue pole. Cravet Red, white and blue with gold embroidery and fringe. Like the Officer he has gold epaulettes. Again he is clean shave, however you can see the end of some glorious side burns sticking out the bottom of his bearskin helmet. The actual standard has been hand painted it looks fantastic. Again he really oozes the era he is from. The Gloss finish is perfect for this line. Next come the two Sapeurs (Sappers). First thing you notice is that these two sport a fine beard. It was compulsory for all Sappers to grow a beard in the French Army (for a long time you had to have a moustache in the British Army). Plus Sappers wore the grenadier uniform. On both upper sleeves they have the crossed axe and grenade badge, the symbol of the Sapeur. These strong men with fine facial hair marched together and close to the band and Standard bearer. A corporal and four privates where chosen from a Grenadier battalion to become Sapeurs. Here they are marching with their Axe (issued to all Sapeurs) over their right shoulder and their Charleville Musket over their left shoulder. Wear bearskin cap with red plume. The coat is dark blue with dark blue collar, white lapels and red turnbacks. They also wear white gauntlets that reach their elbows plus a long white apron that goes from their waist to half way down their shins. They wear red and gold epaulettes. On their backs they carry a calfskin knapsack with a rolled great coat on the top. They also carry an ammunition pouch as well as their infantry Saber and bayonet scabbard. A Bicorn is folded and tied to the Knapsack. They have white cross belts with brass grenades and buckles. They also wear black boots with white gaiters. Again the gloss finish is perfect and look very authentic. The two Sergeants wear a very similar uniform as the Standard bearer. However they sport a fine moustache. They also carry their Charleville musket but this time they have their left arm folded across it and it is in an upright position with bayonet attached. They have their Sergeant stripes on their left upper sleeve. They wear red and gold epaulettes. Wear bearskin cap with red plume. They are wearing dark blue coat with dark blue collar, white lapels, red cuffs with white flaps, red turnbacks and pocket piping. White waist coat with brass buttons and white breaches. White crossbelts. On their backs is the standard issue calfskin Knapsack with a rolled up great coat on top. Below the Knapsack is an ammunition pouch\box. Their Bicorn het is also folded flat against the Knapsack. Again they have the Infantry Saber and bayonet scabbard attached to their belt. Black boots and white gaiters. Two fine French grenadier sergeants you'll be proud to own. Finally we have the two drummers. These two wear the standard Bearskin cap with red plume. They also sport a well groomed moustache. The coat is dark blue with dark blue collar, white lapels, red cuffs with white cuff flaps, red turnbacks. Mixed red and gold epaulettes. White waistcoat with gilt buttons. They have black boots and white gaiters. On their backs is a calf skin Knapsack with rolled great coat on top, white straps. Bicorn folded and tied to knapsack. White crossbelt. Infantry Saber scabbard attached to belt. The drum is brass with blue hoops bearing white grenades. White cords and sling. White drum carriage with brass stick holder and grenade. White apron. Black boots with white gaiters. Black drum sticks. Two fine drummers and round of this set beautifully. More examples of superb sets. I'll admit that I'd probably never have bought this set as old style gloss finish soldiers didn't appeal to me. However I'm now a convert. They appeal in a different way to the modern looking matt finish soldiers out there. They arouse a nostalgic feeling the others don't and in away when in their presentation box give them an authentic look, like you're looking at a set of toy soldiers from a hundred years ago or more. This makes them special and as I said appeal in a different way to the highly detailed, perfectly sculptured modern figures. That's not to say these don't look great and they are very well sculpted. Never thought I'd feel this way to be honest. So this set has added a whole new area for me to get excited about! I said at the start I couldn't have picked a better set to review after the two Thomas Gunn reviews. A set that shows off the brilliance of the gloss finish toy soldiers, in all their old fashioned glory. 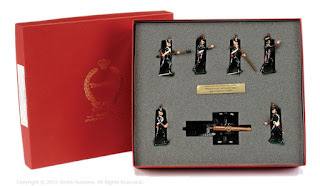 I can't think of any Toy Soldier collector or anyone interested in the Napoleonic Wars that wouldn't beam from ear to ear if they received this set as a birthday or Christmas present! The set retails at £129.76. Worth every penny! I hope we can continue to review Tradition of London excellent range in the future. If so I can't wait for the next parcel to arrive from Tradition of London! Tradition of London Click Here..